John DeLorean was nothing short of an automobile maverick. He was the father of the GTO, Firebird, and just about every performance Pontiac out of the muscle car golden era. Unfortunately his heavy drive had him clashing with GM upper management throughout his employment at GM. After his great success with Pontiac, he was elevated to head of the Chevrolet division and then soon thereafter bumped up to Vice President of all GM car and truck production which was essentually a grooming position for President of GM. Then without warning DeLorean decided to part ways with GM, he had bigger fish to fry. Instead of wanting to run the biggest automobile company in the world, he had his sights set on starting his own car company. For the man that molded Pontiac into the performance automaker and sent sales at Chevrolet skyrocketing, he had big plans for his new company – the DeLorean Motor Company (DMC) which was formed in 1975. 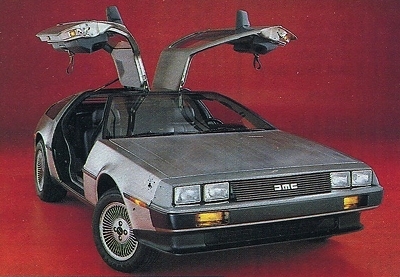 DeLorean would start with building a 2-seat sports car called the DMC-12. His vision wasn’t for a pedestrian mass produced sports car yet a special kind of car that the world had never seen before. 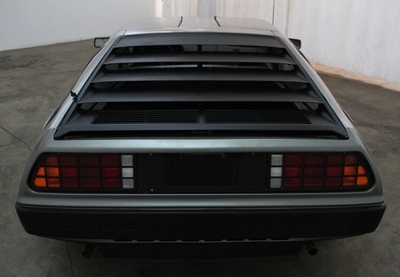 DeLorean wanted to produce a game changer in the automobile industry. He had a laundry list of accomplishments working for GM, and it was only natural to expect this success to spill over into his new company. He found the right man to help with creating his new car, Bill Collins who had risen to Assistant Chief Designer at Pontiac before DeLorean convinced him to work for his new company. Collins was instrumental in getting the DMC-12 from a sheet of paper to production prototype. However the man responsible for the creation of the design of the DMC-12 was no other than the famous Italian automobile designer Giorgetto Giuriaro. The DMC-12 name may have not been a flashy name but it was certainly a exotic one-of-kind flashy car. The body work was 100% original – no borrowing from any other cars before its arrival. The sheet metal was very sleek. It had a wide stance (73.1 inches) but a very low height (44.9 inches) and a length of 166 inches. The wheelbase was a 95 inches. The overall bodywork was exotic, the DMC-12 looked like it was a car plucked from 30 years in the future. Which was really saying something since the car had four fixed square headlights and not the typical pop-up headlights most exotics had back in the day. The body work was clean with no outlandish spoilers. There was a black front chin spoiler that blended with the rest of the body work and the rear didn’t have a spoiler but rear black louvers that gave the DMC-12 a fastback look. However the real masterpiece feature of the DMC-12 was the gull-wing doors. They not only looked fantastic when they were completely opened but they made it so easy to slide into the DMC-12’s interior. The door design didn’t allow for the full large side windows to retract inside them, so a smaller sub-window was added to both windows which could more easily retract into their respective doors. It was the outer shell of the car that caught the attention of onlookers since it was stainless steel. The stainless steel finish was so unique. Granted, trim pieces and other decorative pieces on other previous cars had been stainless steel – Cadillac had even offered a stainless steel roof on two different iterations of its Cadillac Eldorado Biarritz. However no automaker was bold enough to make the entire body of stainless stain. It was an extremely bold move that paid off, it gave the DMC-12 something none of its competitors had. The added benefits with stainless steel were it had brilliant shiny finish and it didn’t rust (but it was susceptible to tarnishing). The bad was that because of the body consisting of unpainted stainless steel the DMC-12 wasn’t offered in any other colors. If a buyer didn’t like the shiny silver color – Tough, the buyer had to live with it. Having no exterior color options did however make the DMC-12 easier and less costly to produce. And due to the use of stainless steel body panels, the flexible plastic front and rear bumper areas have a slight color variation when compared to these body panels that is easily noticeable to most eyes. The structure underneath was a Lotus derived double Y-body frame design which was designed specifically for the DMC-12 by Colin Chapman from Lotus. This frame structure provided excellent strength while keeping the overall weight of the DMC-12 way down. While most exotic 2-seat sports cars by the early 1980s were well over 3,000 lbs, the DMC-12 had a light curb weight of only 2,712 lbs. This weight was not very well balanced since since the DMC-12 was a rear-engine layout giving the car 35% front and 65% rear weight distribution. Original plans called for a mid-engine layout which would have offered a better front to rear balance. Even with this handicap the DMC-12 with its Lotus designed 4-wheel independent suspension which consisted a racing style front wishbone and a multilink rear setup was a good handling car that could pull .77 g on the skidpad – not spectacular but good enough. The suspension surprisingly had good manners when it hit rough pavement. There were coil springs and tubular shocks on all four corners of the car. The DMC-12 used Goodyear NCT performance tires – P235-60HR15 size in the rear and P195-60HR-14 size in the front. The reason for the much larger tires in the rear was due to the heavy rear weight – the much larger and wider tires provided the necessary road grip. Steering was tight and precise. A rack and pinion steering design was used which made use of a performance oriented steering box that had a very tight 14.9:1 steering ratio. So far the DMC-12 had what exotic car buyers wanted, until you got to the engine. DeLorean after mulling over a few different engine options decided to go with a Peugeot-Renault-Volvo jointly developed (more commonly known as the PRV) SOHC (2 valves per cylinder) 2.8 liter V6 which used Bosch K-Jetronic fuel injection as its induction system. The engine was reliable but only had 150 horsepower (and 162 lb-ft of torque) for markets without U.S. EPA mandated emissions controls which wasn’t bad, but not enough to really make the super exotic looking DMC-12 shine. In U.S. emissions compliant form, the V6 only produced 130 horsepower and 150 lb-ft of torque. This was bad news for the DMC-12, since it had a base price of just over $25,000 which was big chunk of change back in 1981. As a comparison the 1981 Chevrolet Corvette, one of the DMC-12’s main competitors, had a base price of only $15,248. And the Corvette was standard with a 190 horsepower 5.7 liter V8 – this was 60 horsepower more than the DMC-12. Another competitor, the 1981 Ferrari 308 GTSi was a bit more pricey than the DMC-12 at a base price of $52,650 however it went 0-60 mph in 7.9 seconds and did the quarter-mile in 16.1 seconds. Its 214 horsepower 2.9 liter V8 made the DMC-12’s V6 look like a underpowered economy car motor. In non-U.S. spec it was capable of around a 0-60 mph run of around 9 seconds but in U.S. spec it took 10.5 seconds to reach 0-60 mph and 17.9 seconds to finish the quarter-mile. And in case that wasn’t embarrassing enough, the U.S. DMC-12 had a top speed of only 109 mph (the Ferrari 308 GTSi had a top speed of 149 mph) and it took a full 40 seconds to reach 100 mph from a standstill. The problem with the DMC-12 was it needed at least 180 horsepower in U.S. spec in order to remain a player in the performance car game. In order to really be competitive it needed at least 200 horsepower. As a sign that things were pretty dire for the DMC-12 in terms of performance, when the front-wheel drive econobox 1981 Chevrolet Citation X-11 was equipped with a 135 horsepower 2-bbl 2.8 liter HO V6 that produced 135 horsepower and went 0-60 mph in 8.5 seconds. This was where DeLorean really miscalculated – he had originally planned on the DMC-12 costing $12,000 but by the time production got started the price had more than doubled due to cost overruns. 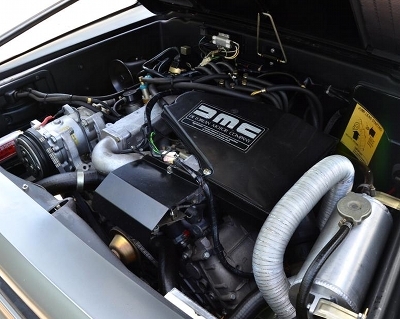 DeLorean should have used a more powerful motor for the DMC-12. The DMC-12’s pretty face harvested some sales and certainly brought plenty of attention but the lack of a performance oriented engine seriously hurt the DMC-12. Even though other factors occurred that spelled DMC’s demise, the lack of a serious performance motor put at least a few nails in the DMC’s coffin by killing a good number of potential sales. There were two transmission choices with the DMC-12, a buyer could opt for either a 5-speed manual or a 3-speed automatic. The DMC-12 was standard with performance oriented 3.44 rear gears. Power 4-wheel disc brakes were also standard. The DMC-12 was more than anything else, a flashy status symbol, and nothing proved this more than the beautiful interior. There were only two color choices gray or black. Everything else in the interior was standard including the ultra modern soft leather bucket seats and power everything. The gauge cluster was well laid and easy to read. From behind the wheel this was a comfortable drivers car, which appealed to the business executive crowd. The only downside is occupants over 6′ tall had very limited head room due to the low roofline. The gull-wing doors were easy to open from the interior and not hard to close if you were of average height or taller. However the door struts tended to prone to premature failure which kept the doors from staying in the upright position. All-in-all the DMC-12 was a solid car, even though it did have its share of production problems and quality control issues. However cost overruns and the release of DMC-12 during very bad economic times of the early 1980s, hit DMC very hard. So bad that by the end of 1982, it went into bankruptcy after only 2 model years of production. And before the final cut was made there was a brief third year (1983) of production output. DeLorean trying to rescue his DMC from the abyss was caught in a narcotics sting operation. DeLorean was later acquitted of all charges due to entrapment. Even though he was found innocent in a court of law of all charges, this debacle had eliminated any hope of Delorean reviving his terminally ailing DMC and tarnished his once stainless steel reputation. The plant where the DMC-12 was built in Dunmurry, Northern Ireland never reopened. DeLorean then spent the rest of his life working on other ventures which never seemed to get off the ground. However he actively worked behind the scenes trying to solicit support for the revival of his defunct company. He even actively pursued financing for the production of new DeLorean cars none of which ever got past a drawing table. Unfortunately DeLorean wasn’t able to obtain the funding to re-launch DMC before he died in 2005. In summation, the DMC-12 was a beautiful piece of rolling automobile art. It took guts for DeLorean to walk away from a stable high-salaried job at the world’s biggest automaker, especially since he was a shoe-in to head up the company had he stayed. Instead he forged his own path with DMC. He may have failed in his endeavor. And had not fate stepped in, the 8,583 DMC-12s produced from 1981 to 1983 may have been forgotten by most people. Fate in this case was the successful Back to the Future movie series which showcased a DMC-12 as a time machine in three big blockbuster movies, forever solidifying the DMC-12 a special place in automotive history. The Back to the Future trilogy inadvertently changed the "DMC-12" name in American culture to "DeLorean" since the lead characters referred to the car only as a "DeLorean" instead of the correct "DMC-12". 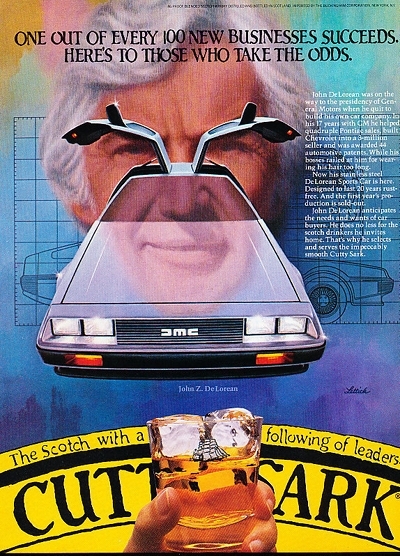 And even though John DeLorean has passed on, along with Pontiac which is long gone, his DMC lives on. 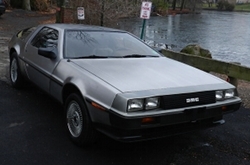 DMC was revived in Texas shortly after DeLorean’s death, using leftover production parts from the Dunmurry factory. It was a large inventory of parts. There are enough parts on hand to keep many DMC-12s on road for many years to come along with producing about 20 new DMC-12s per year from these never before used parts. The newly revived DMC now offers performance modifications and upgrades to the original PRV 2.8 liter V6 allowing the DMC-12 to finally reach its true performance potential, along with other DMC-12 enhancements. And surprisingly DMC has recently released a brand new 2013 DMC-12 EV variant which is an electric powered version that goes from 0-60 mph in 4.9 seconds. Now who would have thought that possible?